The M45 Motorway is to be designated as a heritage motorway, Transport Secretary Alistair Darling has announced. The road, built in 1959, is one of Britain's oldest motorways, and has changed little since then. It still has many original features, including the very distinctive bridges designed by Sir Owen Williams and Partners for the M45 and adjoining M1. When first opened, the M45 was one of Britain's busiest roads, but the opening of the M6 a few miles to the north in 1972 meant that most London to Birmingham traffic no longer uses the M45. 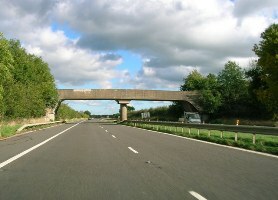 The transport secretary said "The M45 is a valuable part of our heritage, and it is right that it is preserved in its original state for future generations.."
The Conservative Party supports the move, saying that the road is no longer a significant part of the national trunk road network. However they were emphatic that this should be a one-off designation reflecting the importance of the M45 in the nation's heritage. The Conservative leader said "Whilst welcoming these proposals to protect our heritage, we are opposed to plans to designate other historic motorways such as the M50 and the eastern end of the M2." The Transport Secretary has announced that this is to be the first in a series of designations. The M48 Severn Bridge has been duplicated by the second Severn Crossing, leaving the original bridge as a lightly used example of 1960s engineering. The M50 is also very similar to the day it was opened and includes the only T junction on a British motorway. The A6144(M) is much newer, but is under threat of losing its motorway status. It is a single carriageway link from the M60 to an industrial area on the outskirts of Manchester and is due to be downgraded as part of the M60 widening. "The A6144(M) should enjoy the same status as the M45 and should be preserved as part of our heritage." As part of the process of designating the motorway as a heritage road, it will, in future, enjoy the same level of protection as a grade 2 listed building. It is planned that all signs will be replaced with 1950s style motorway signage, and the modern motorway phones will be rehoused in the 1950s style blue cabinets. The motorway will be patrolled by 1950s style police cars. The designation will also mean that vehicles built after 1970 will not be permitted to use the road.